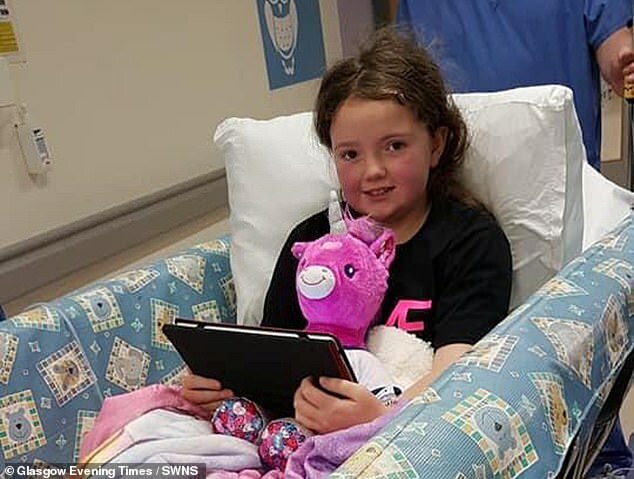 A mother claims she took her eight-year-old daughter to the GP five times with crippling back pain before she was diagnosed with cancer. Sharon Mcalister, 35, took her daughter Kaiann to three separate GPs five times before the youngster was told she had acute lymphoblastic leukaemia. 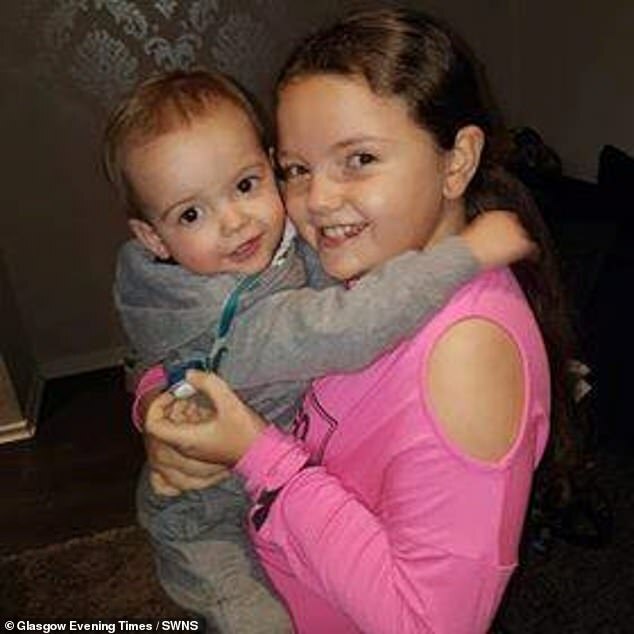 The mother-of-three, of Rutherglen, South Lanarkshire, knew something was wrong when Kaiann developed yellow skin, became irritable and started complaining of severe back pain in early December last year. Mrs Mcalister claims she was ‘fobbed off’ by doctors who dismissed it as everything from muscular pain to a viral infection. By the time she was diagnosed on February 12, Kaiann required morphine for her pain, and was even told her spine was fractured and crumbling. 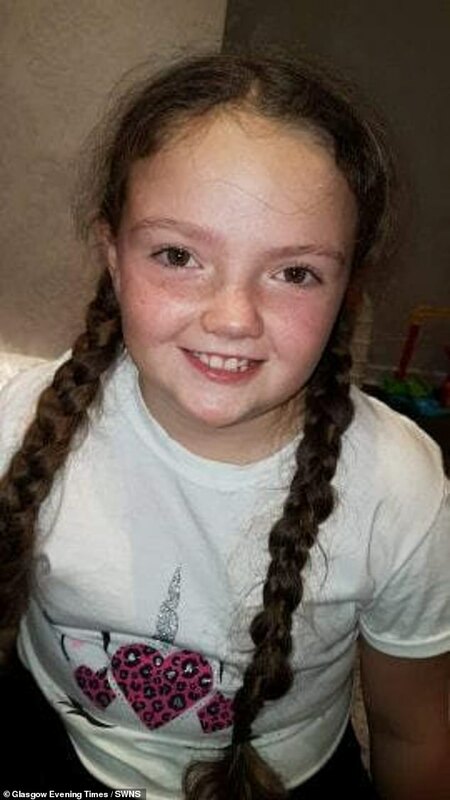 Kaiann is now undergoing chemotherapy at the Royal Hospital for Children in Yorkhill, Glasgow, with doctors being optimistic she will beat the disease. Speaking of her daughter’s condition, Mrs Mcalister – a make-up artist – said: ‘If I could take the pain away from Kaiann I would. Kaiann started developing her symptoms at the end of last year, with Mrs Mcalister also noticing a change in her daughter’s personality. ‘She had started to be distant, snappy and scared with the pain,’ she said. Mrs Mcalister declined to name the GP practices Kaiann was taken to but claims the youngster was seen by one GP three times, a second doctor once and then finally a third medic, who referred her for a hospital appointment. ‘I felt as if I was getting fobbed off. It was put down to muscular pain or a virus,’ she said. ‘Kaiann was getting really scared because she couldn’t walk properly and she was getting spasms in her back that were leaving her in agony. 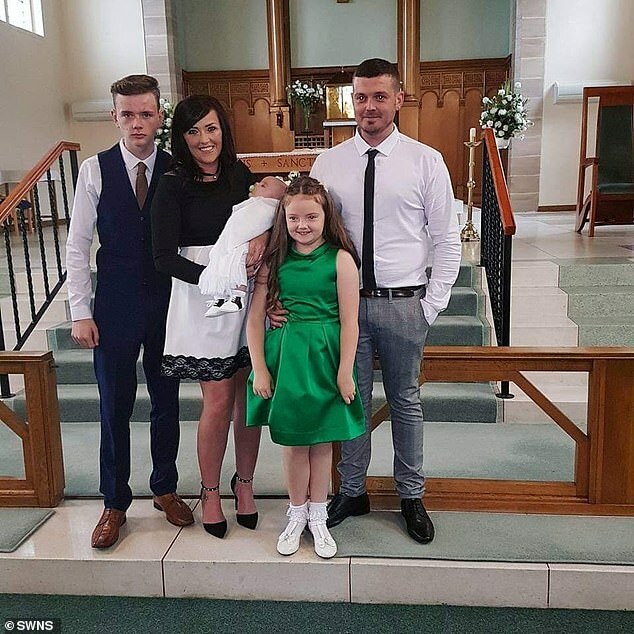 Mrs Mcalister – who also is mother to her two sons 17-year-old Kalin and Karsson, 20 months – did not wait for that hospital appointment and immediately rushed her daughter to A&E. A consultant at the children’s hospital initially thought Kaiann had osteoporosis, which weakens bones, making them fragile and more likely to break. ‘She had fractures and her spine was crumbling,’ Mrs Mcalister said. Acute lymphoblastic leukaemia (ALL) is a type of blood cancer that starts from young white blood cells in the bone marrow. There are around 810 new cases in the UK every year. In the US, ALL affects approximately 1.7 adults per 100,000. Anyone can develop ALL, however, it mainly affects younger people. Risks for developing ALL include exposure to radiation, smoking, being overweight and having a weak immune system. Research suggests being breastfed and exposed to childhood infections may reduce a person’s risk. The main ALL treatment is chemotherapy. Patients may also have radiotherapy, steroids or bone marrow transplants. Kaiann was sent home with plans to send her for an MRI scan in March to confirm her ‘osteoporosis’. But the youngster collapsed that day and was admitted back to the children’s hospital, where a scan revealed she had leukaemia. ‘I just collapsed when I heard it but I knew they were going to tell me it as cancer,’ Mrs Mcalister said. The youngster, who is losing her hair to chemo, plans to donate her locks to the Little Princess Trust, which provides wigs to people under 24 who have lost their hair to illnesses like cancer. ‘It’s been so hard but we will get there and my girl will fight and get better,’ Mrs Mcalister said. ‘From the day she was born, we’ve been inseparable, stuck to each other like glue. Mrs Mcalister is speaking out to encourage other parents to trust their instincts if they know something is not right. ‘Not every child has the same symptoms but please if you feel the doctors aren’t listening to you and deep down you feel something isn’t right then keep pestering them until they listen,’ she said. Mrs Mcalister – who is married to Mark, 33, a cable joiner and electrician – has temporarily taken off work to look after Kaiann. They are fundraising to ‘take a bit off financial stress away from the family at this time’.